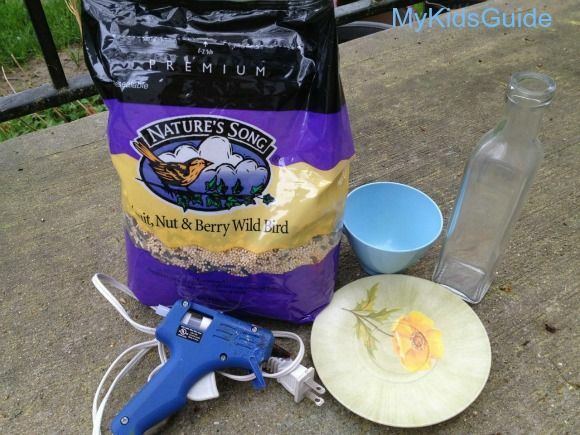 Spring Craft for Kids: DIY Recycled Cup and Saucer Bird Feeder! Spring is an excellent time to celebrate the Earth and all of the gifts we get from it with a fun spring craft for kids! If you enjoy spending time outdoors and feeding your feathered friends, why not try making your own bird feeder? Or better yet, why not recycle materials you already have and create your own? 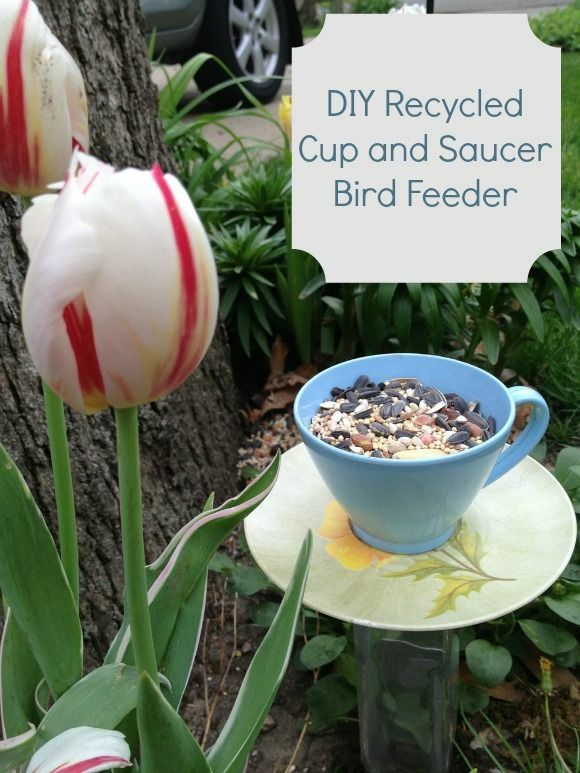 Making your own recycled cup and saucer bird feeder is quite a cinch, and your feathered friends will sure enjoy being treated as well. You don’t need many supplies, in fact you probably already have everything you need right in your own home! Take a look and see how easy it is to make this spring craft for kids in just an hour or so. Before you begin, you will need a cup and saucer. You don’t need anything fancy. In fact for this project, we used simple plastic ones that were in an old picnic basket set. They were slightly faded and had a tiny crack, so instead of pitching them they were used for this project instead. That is the whole idea, nothing needs to be perfect, just purposeful. You can use a chipped, cracked, or mismatch set you have! Wash all of your pieces well so they adhere well. Apply some glue to the bottom of your cup and press it to your saucer. You may wish to turn it over and set a heavy object on it such as books to make sure it applies well. Apply glue to the bottom of your vase. Press the bottom of your saucer to the bottom of the vase until sealed. The opening of the vase will now get slipped over a dowel rod or stick. Press your stick firmly into the ground. Fill your cup with birdseed. That’s it! You are now able to sit back and watch your feathered friends come for a feast! They will love having the saucer to sit and rest on and can easily access the birdseed inside of the cup. To fill you can easily remove the vase from the stick and take indoors, or just fill on location! Not only are these really practical, they are quite whimsical and pretty too. Children will enjoy making them and taking some responsibility in feeding the wildlife as well. In fact, this is an excellent opportunity to start talking about birds, their eating habits, and the species that are native to your area. For more ideas, try these activities for kids about endangered species. Children can even create their own field guides and sketch pictures of the birds they see come to eat, or make a simple list. So don’t toss those mismatched or flawed dishes. Instead, turn them into a recycled cup and saucer bird feeder. Not only will you have a blast making this spring craft for kids, but you will be doing a great deed for the birds in your neighborhood! Looking for another great craft for kids using recycled cups? Check out our cute pin cushion project! This is absolutely darling! I hosted a tea party themed 1st birthday for my daughter and we have TONS of cups and saucers left over just sitting in our china cabinet. This would be an awesome way to use them and attract more birds to our yard. That is absolutely adorable and a great idea. Those would look so cute on my deck. Thanks for sharing. I love this, and it is really cute! I have so many mis-matched cups and saucers from throughout the years but just couldn’t bring myself to throw them because they are really cute; now I don’t have too, I can create really cute bird feeders! That is super cute! I really like how you can re-purpose and old mismatched cup and sauce and make it into something so incredibly adorable! I love it. Amber Edwards recently posted..How to Teach Children to love reading books; Developing a love of reading in children. I love this! We have so many saucers and cups laying around I could totally do this craft project. Awesome idea!